This warm cheesy dip is delicious. 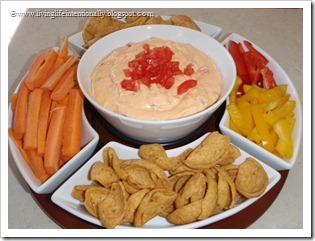 You can serve it with Fritos & veggies like peppers & carrots. I think it is perfect for fall because of the fall colors on the spread & because it is warm, it warms you up. Put all ingredients together in a microwave safe bowl. Microwave 2 minutes; stir. Microwave one more minute. It should be all melted together – serve warm.